In Siberia’s far north, a remote peninsula known as the Yamal-Nenets Autonomous Region sits within the Arctic Circle. It’s isolated. Roughly 2000km north-east of Moscow and separated by the mighty Ob river, temperatures frequently drop below -40◦C. 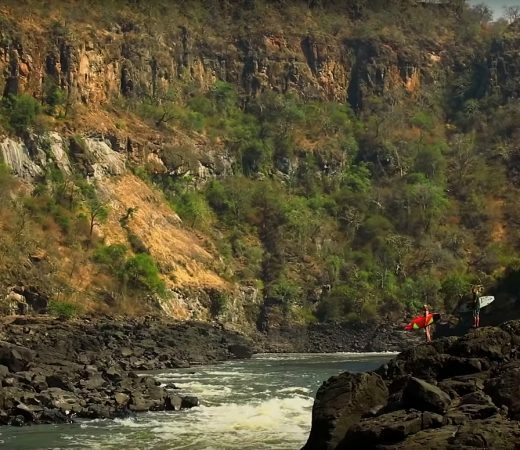 Here, an ancient indigenous population have been thriving in these extreme conditions, their nomadic lifestyle largely unchanged, for over 8,000 years. Secret Compass team mate, Rebecca, journals her experience of the extraordinary lives of the Nenets, and life on the tundra at the ‘End of the Land’ during the 2017 team expedition to the region. Nenets are reindeer herders. Their livelihood depends wholly upon their livestock and each brigade migrates hundreds of kilometres every year with their herd in chase of fresh pastures. 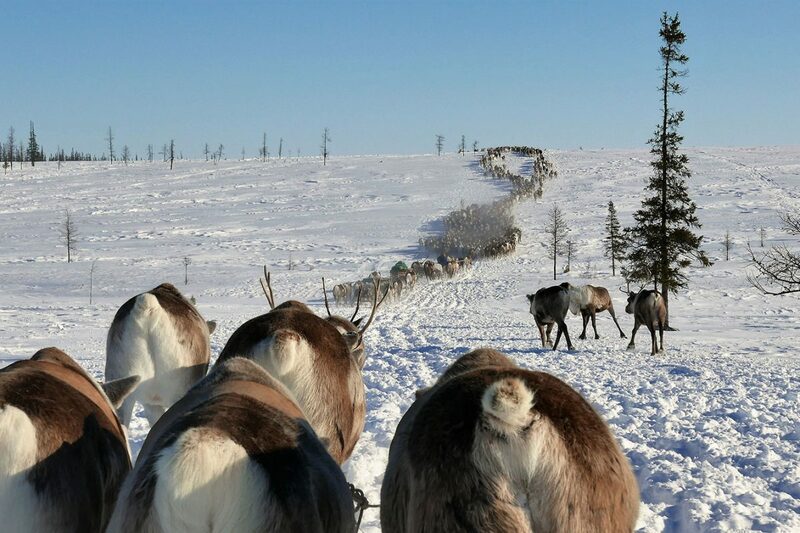 Reindeer herding provides income, but also most of the resources they need to survive: transport, food, shelter, and clothing. 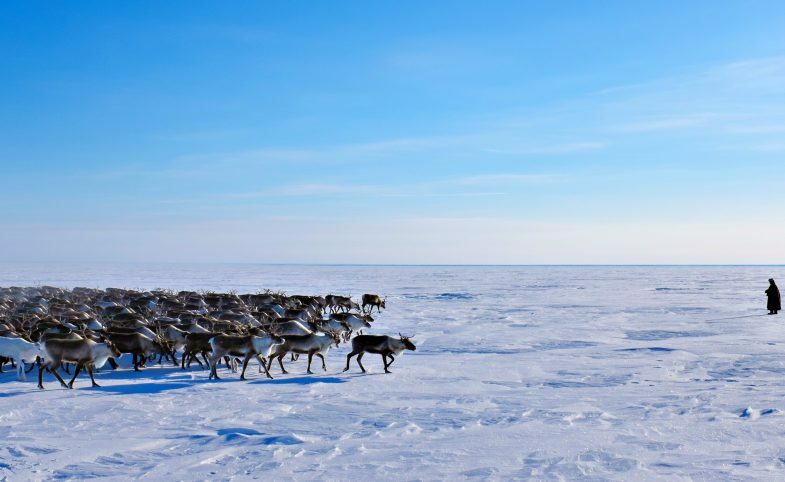 Our mission was to join the Nenets and their 3,500 strong herd of reindeer on their longest migration of the year, a crossing of the frozen Gulf of Ob – the longest estuary in the world, connecting Yamal’s administrative centre of Salekhard to the Arctic Ocean. Over two days, we would cross the southern tip of the gulf to reach the town of Yar Sale, just in time for the annual Reindeer festival. 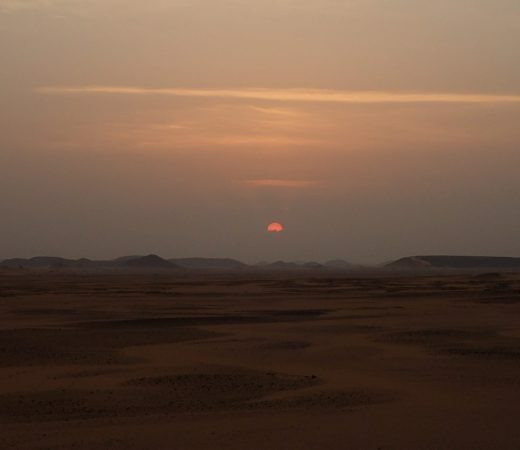 But first, we needed to prepare for the migration ahead, spending time observing and adapting to a life so far removed from what we know in the western world. 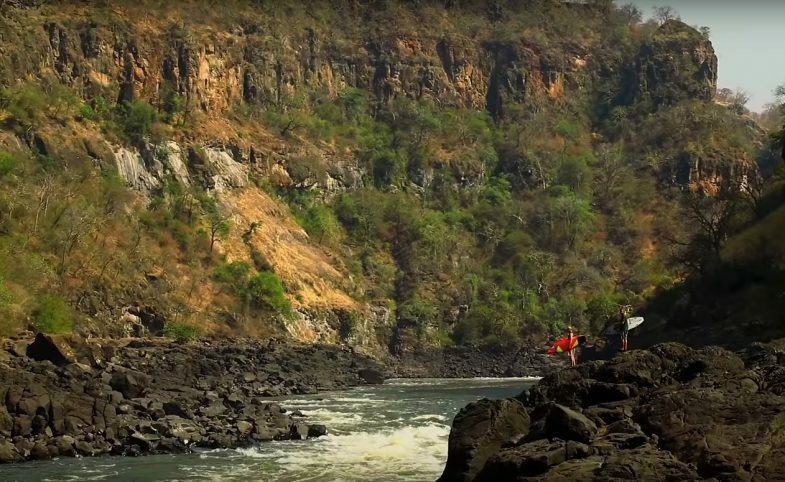 A life so unsettlingly isolated, yet comfortingly simple and somehow familiar in many ways. Our home for the next eleven days would be a small collection of Chums – portable, teepee-style tents constructed from a frame of wooden poles and insulated against the freezing conditions with the skins and furs of dozens of reindeer. The Chums are small, but comfortably fit large families and guests. As an expedition group, we were divided amongst the families and assigned a Chum to stay in. 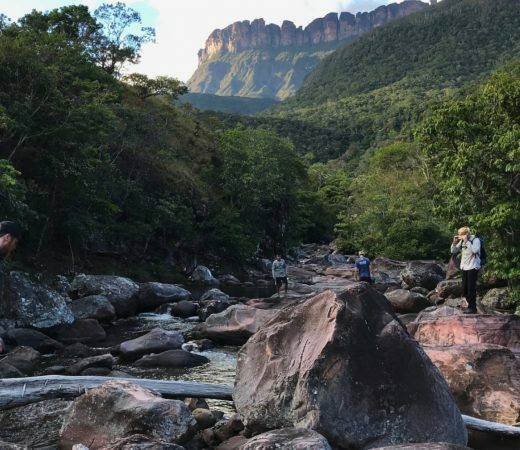 Despite the language barrier, we soon formed strong bonds with our families, playing games with their children, showing them pictures of our homes, and attempting to help with household duties like ice collection, wood chopping, and meal preparation. Perhaps one of the most challenging everyday tasks though was going to the bathroom. A lengthy trek to the tree line through soft, uncompacted snow, merciless in trapping its victims down to their waist if they dared take a wrong step. A fate which provided us with ample comic relief as we watched our counterparts disappear into the powder. A common sentiment many of us expressed during this time was the realisation of the unnecessarily clutter in our lives back home. 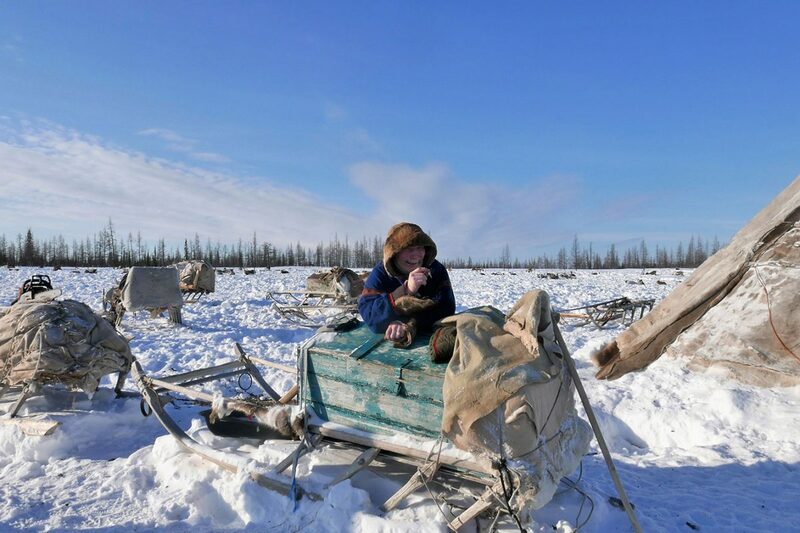 Driven by necessity, Nenets use only what they need, wasting nothing. 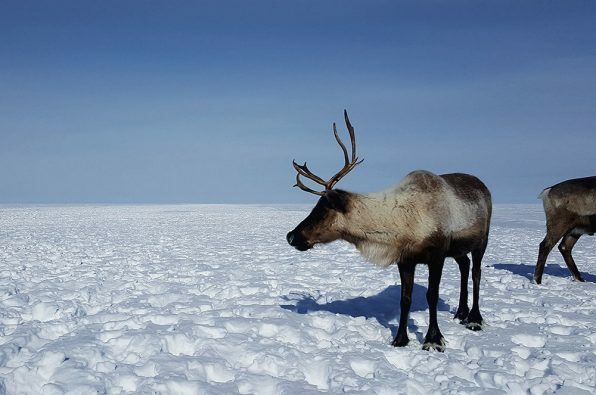 When a reindeer is slaughtered, more than 90% of its body is used for domestic needs – this includes using the sinew as thread to sew clothes, and tying some bones around a small puppy’s collar to prevent it from chasing after snowmobiles or reindeer. As food, reindeer meat is consumed raw and frozen, seasoned with salt and hot mustard. It’s also the star of hot stews, pastas, and a delicious risotto-like rice dish, the most comforting thing in the world after a day out in the cold. To our surprise, the Nenets also consume a high amount of processed white bread and condensed milk, gooseberry jam, and candy. After about a week, we’d become used to life on the tundra and completed a few days of migrations. The festival in Yar-Sale was nearing, and we’d arrived on the banks of the Ob. One thing to get used to in the Yamal is that there are no schedules or advance planning whatsoever. 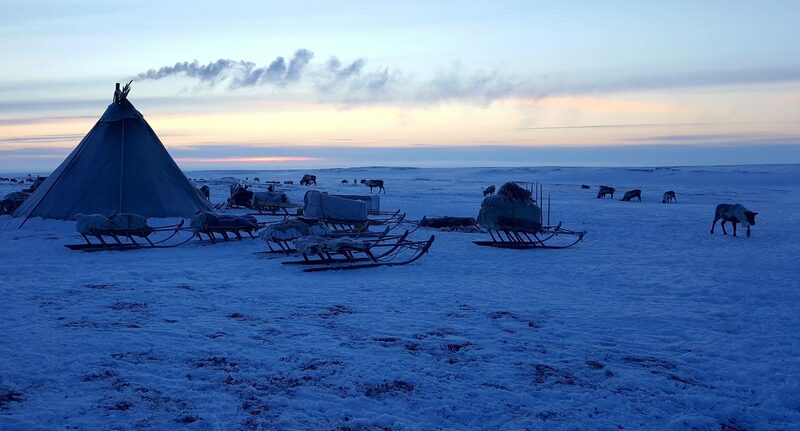 Welcome to Nenets Time, where the days are made up and the clocks don’t matter! 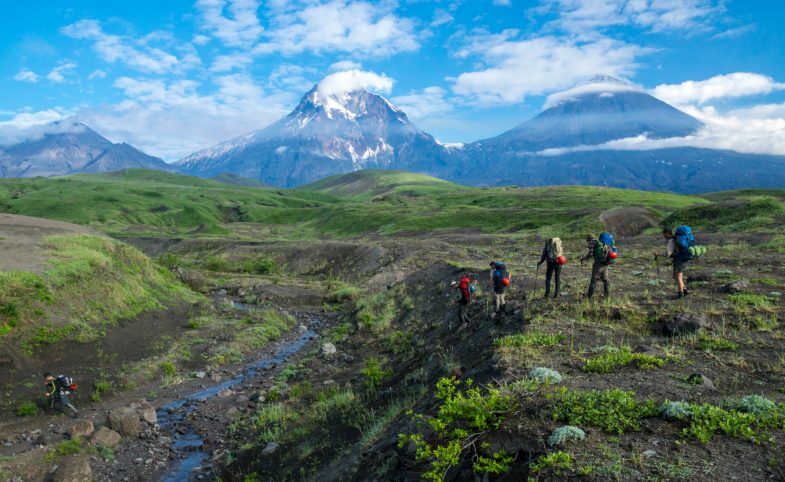 In fact, the official plan for meeting our hosts and getting out on the tundra at the start of the expedition was “we’ll find out when we get there”. 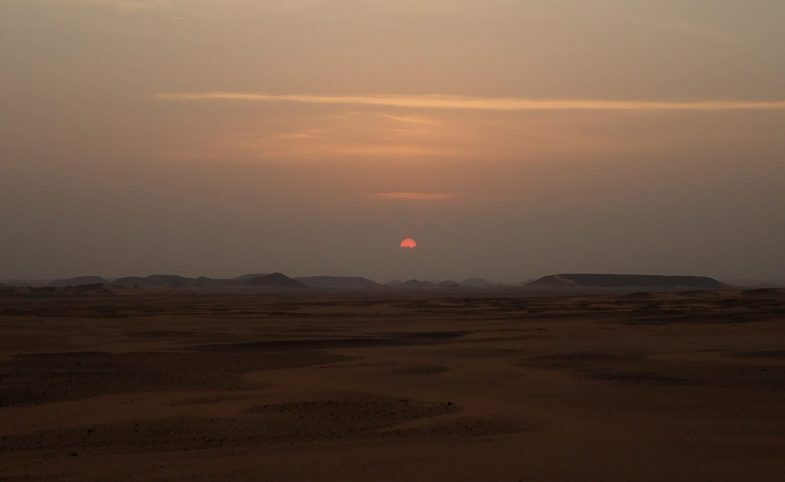 Following this principle, word was spread on camp that we’d be setting out on the migration the following morning. After packing down the chums, strapping the possessions to sledges and corralling up some reindeer, we were ready to go late morning. We launched across the endless horizon of sparkling white ice meeting a spectacular blue sky, weather that could almost be considered warm. But the weather here can change in a snap. As we raced the daylight to reach an island in the middle of the river (camp for the night), skies quickly turned and we found ourselves battling a dark, windy snowstorm. With the crossing completed on the afternoon of the second day, we were finally back in view of the lights and buildings of civilisation. 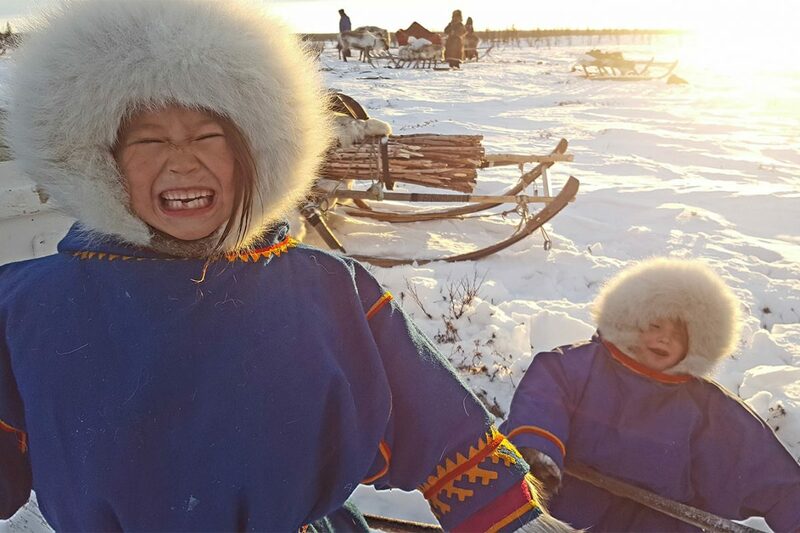 In Yar Sale, the festival bought with it the chance to further understand the culture and history of the Yamal region at large, and meet all kinds of characters. 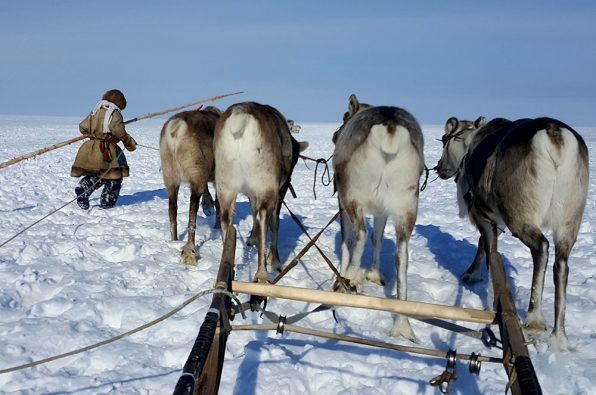 Nenets had come from all over to watch concerts, join parades, and compete in sports such as ‘the national struggle’ (wrestling), ‘catching the ferret’ (no ferrets involved), and the most important of all, the reindeer sledge racing – for which the grand prize was a brand new Yamaha snowmobile. We were able to visit a small museum housing relics and a documentary about Lyuba, a baby mammoth body discovered in the area, and wander markets sampling local foods and handcrafts. 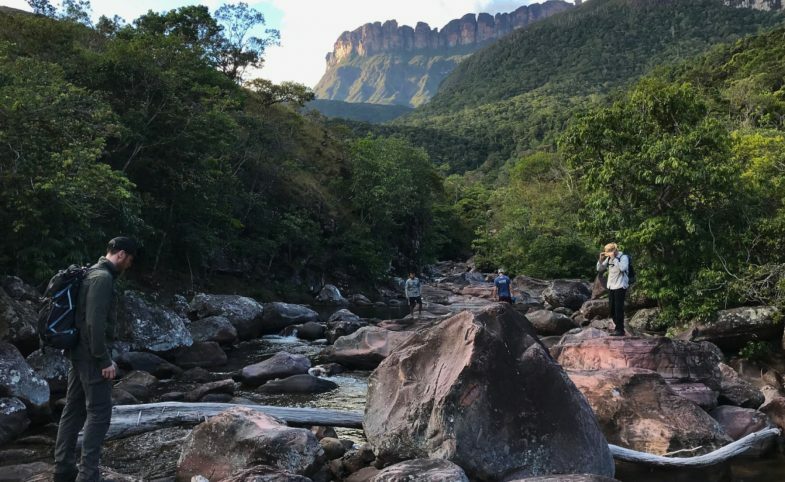 Though cultural immersion is not as easy as it sounds, and there were occasions I broke down in overwhelmed frustration, the sheer beauty of life here is undeniable. I found myself utterly captivated by whirling snowstorms and aurora borealis and in awe as I stood just outside camp at dawn, watching the first hint of smoke cut through the sunrise in the company of curious reindeer. But greater than anything else, was the joy in a sentiment expressed to me in some way or another by nearly every local I met in this region: We have come from vastly different parts of the world, united by our “love of the north,” as one put it. But still, in the words of my ‘chum mums’ Vera and Ana, we understand each other. We are the same. In a small house in Yar Sale, a few of us shared lunch with an elderly man who told stories of life in the Yamal through decades of political change. Never in his wildest dreams did he think he would be sitting in his kitchen with guests from the other side of the world. His wife plucked a magnet from their fridge to give to me as I left, and I still keep it stuck firmly on mine.